Figuring out how to clean up Portland Harbor to the satisfaction of the U.S. Environmental Protection Agency has been a challenge for Portland industries bucking the agency's position on the distribution of river toxics. As recently as March of this year, EPA wrote a stern letter to the Lower Willamette Group -- a collection of industries taking the lead in studying the harbor's pollution and figuring out ways to remedy it -- arguing that LWG showed myopia about background chemicals drifting into the cleanup site from upriver and could undermine cleanup efforts. Among other things, the federal agency directed LWG to conduct extensive estimations of the presence in the river of some 23 chemicals. Nobody disputes that big patches of the Willamette River bottom in a 10-mile segment of the designated Superfund area constitute a toxic mess. PCBs and pesticides are among the carcinogenic chemicals embedded in mud and show up in "hot spot" sediment concentrations far exceeding safe levels for humans and fish. But an estimated 150 businesses and municipalities, among them the city of Portland, will pay to clean things up at a cost that could top $2 billion over several years. The financial stakes are as high as the environmental threat, built over a century of unbridled industrial activity in the city's marine hub. Now the EPA, after years of studying the site and negotiating with LWG, has markedly changed the game. Without fanfare, the agency has told Portland officials it's done gathering data and spelled out five alternative cleanup scenarios -- a bold stroke pitching responsibility to Portland for helping to configure a rational plan forward. It had been feared EPA would release its own version of a cleanup plan, possibly onerous in scale and leaving harbor industries and Portland officials palms skyward. With a menu of cleanup choices, however, the region can avoid getting stuck on a single EPA vision and argue instead about what's right for the river and for Portland citizens and industries. Projected cleanup costs range from zero, for doing nothing, to well beyond $2 billion, for doing extensive dredging, sediment removal and treatment, and capping over many years. That's not to say EPA won't get its way. Its job is to ensure compliance with federal environment laws. But it became clear in recent weeks the agency seeks to ensure a balance is struck between adequate remediation and cost. Public hearings are ahead. An EPA technical advisory group will meet in Portland in November to weigh Portland's concerns against the options. And EPA, after years of study at times marked by tussles with LWG, hopes to have a working plan in hand next year. That will be key in a process already spanning several years: Not until EPA's record of decision is achieved can the harrowing process of cost allocation -- deciding who pays how much to repair the river -- be fully brokered. In an interview with the editorial board of The Oregonian/OregonLive, EPA Regional Administrator Dennis McLerran was plain: "We're driven by the data. Our preferred alternative will be a hybrid (of the plans). We're framing up the issues. 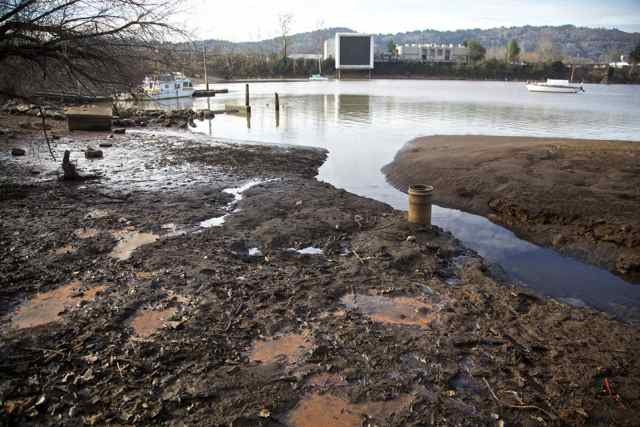 We know that the river is slowly, naturally recovering -- 60 percent to 80 percent (of the harbor) would be under natural recovery -- but 13 hot spots require active remediation, and that's EPA's real focus." Doing nothing is not an option, surely, though doing nothing may well have a few adherents in the "dilution is the solution" school of remediation. But EPA documents show the other four cleanup scenarios all "address the unacceptable risks to human health through capping, dredging, in-situ treatment" at progressively escalating intensities and cost. A mid-level scenario, for example, would feature the removal of 1.6 million cubic yards of contaminated sediments from 140 acres of river bottom and more than two linear miles of riverbank, as well as capping nearly 60 acres of river bottom, in a project lasting five years and costing slightly more than $1 billion. That contrasts sharply with EPA's most extreme cleanup scenario, in which nearly 6 billion cubic yards of contaminated sediments are removed from 444 acres of river bottom and nearly four miles of riverbank, while 168 acres of the site are capped -- all in a project taking 12 years and costing an estimated $2.4 billion. These are mind-numbing numbers either way, consequential to businesses and municipalities and taxpayers. Everything's open to negotiation -- though it's clear any hybrid approach must warrant the 13 hot spots are eliminated or contained while the river is otherwise allowed to continue its natural recovery. Portland officials and LWG should closely examine EPA's menu and make known what's doable while ensuring Portland Harbor no longer poses hazards to the people and fish depending on it. Complex Superfund sites have flourished elsewhere. There's no reason it couldn't be so in Portland.